The Puli was brought to Hungary from central Asia by the Magyars during the 9th Century. The name Puli means "drover" and for centuries, the Puli was used as a herding and droving dog. An affectionate, intelligent, assertive and devoted companion, the Puli is suspicious of strangers and makes a good watchdog. 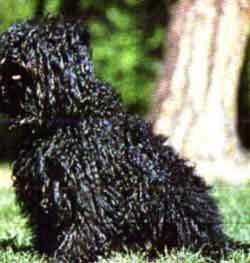 The most striking characteristic of the Puli is its unique, heavily corded coat. The dense, weather-resisting double coat forms cords that may vary from wide strands to small round cords. The cording process begins when the puppy's coat starts to form into bunches and cording will generally be complete over the entire dog by the age of two. Acceptable colors are black, reddish black, grey or white. Although a medium size dog, the coat makes him look much larger. The males weigh 25 to 35 pounds and are 16 to 18 inches at the withers. The slightly smaller females weigh 20 to 30 pounds and stand 14-16 inches.